"This easy pork chop dish has a crunchy and delicious coating made with Parmesan cheese, sage, and lemon peel." Preheat oven to 425 degrees F (220 degrees C). Lightly grease a 7x11-inch baking dish. Mix flour, salt, and ground pepper in a shallow dish. Combine bread crumbs, Parmesan cheese, sage, and lemon peel in a shallow dish. Gently press pork into flour mixture to coat and shake off excess flour. Dip into beaten egg, then press into bread crumbs. Gently toss between your hands so any bread crumbs that haven't stuck can fall away. 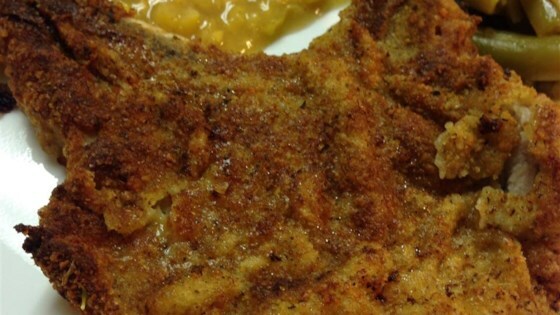 Place breaded pork onto a plate while breading the rest; do not stack. Heat olive oil and butter in a skillet over medium heat. Brown pork chops on each side, about 4 minutes per side, then transfer to baking dish. Bake in preheated oven until juices run clear and a meat thermometer inserted into the middle of pork reads 160 degrees F (71 degrees C), 10 to 15 minutes. So easy and great tasting. Followed recipe except didn't have lemon zest. Will add to my favorites.